TOKYO — The lawyers for Nissan's former Chairman Carlos Ghosn, who was sent back to detention while out on bail, filed a protest with the Japanese Supreme Court on Wednesday. Lawyer Junichiro Hironaka told reporters that Ghosn's fourth and latest arrest is unfair. Ghosn was arrested in November, released on bail last month but re-arrested last week. 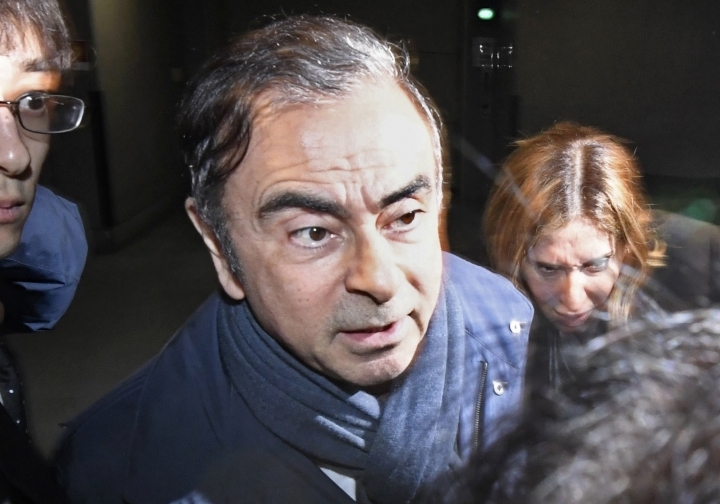 Ghosn's detention has been extended through Sunday but may be prolonged. He is charged with falsifying financial documents in underreporting his retirement compensation and breach of trust in what prosecutors call dubious payments. Hironaka was among 1,010 lawyers, academics and other legal professionals who signed a call to eliminate Japan's so-called "hostage justice." Kaku Imamura, a lawyer who led the initiative, told reporters Wednesday that Ghosn's case has set off international criticism about the longtime detentions without convictions. He said innocent people who refuse to sign confessions suffer and are kept for months, sometimes years, even for relatively minor charges that won't result in prison time. During detention, prosecutors can grill the suspect for more than eight hours, he said, while the suspect's contact with lawyers is limited, and often banned with family and friends. He declined comment on the specifics of Ghosn's case. "Detention is used as a form of torture," Imamura said at the Foreign Correspondents' Club of Japan. "It becomes difficult for people to get a fair trial."